Steganos Privacy Suite is a comprehensive security software that can help users to encrypt safely valuable data to prevent any unauthorized access. This application is user-friendly with a simple interface. With Steganos Privacy Suite, users able to secure portable device, manages and organizes all password and access information with password manager, and delete unwanted data permanently with file shredder. In addition, it also comes with Steganography, email and web encryption functions, Internet trace destructor, and optional Steganos AntiTheft. Fill in a valid email address, and then click on “Abschicken” button. An email (from “Steganos GmbH” no-reply@steganos.com) with the serial number will be delivered to registered email’s Inbox once form is submitted. 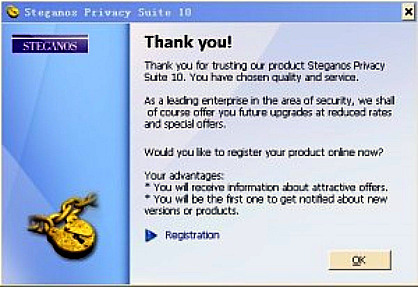 Install the Steganos Privacy Suite 10 and use the serial number to register and unlock the trial to full version program. Steganos Privacy Suite 10 is compatible with Windows 2000, Windows XP, and Windows Vista (32-bit & 64-bit) operating systems.